As the Trump administration repeals the U.S. Clean Power Plan, a new study from the University of Michigan underscores the urgency of reducing greenhouse gas emissions—from both environmental and economic perspectives. For the U.S.'s most energy-hungry sectors—automotive and electricity—the study identifies timetables for action, after which the researchers say it will be too late to stave off a climate tipping point. And the longer the nation waits, the more expensive it will be to move to cleaner technologies in those sectors—a finding that runs contrary to conventional economic thought because prices of solar, wind and battery technologies are rapidly falling, they say. Steps outlined in the Clean Power Plan, as well as in the 2016 Paris climate accord, would not have been enough to meet the goal of keeping global temperature increase to 2 degrees Celsius by the end of this century, the study shows. To achieve the 70-percent reduction target for carbon dioxide emissions used in the study, additional steps would be needed—and before 2023. The window for effective action could close that early. "If we do not act to reduce greenhouse gas emissions forcefully prior to the 2020 election, costs ?to reduce emissions at a magnitude and timing consistent with averting dangerous human interference with the climate will skyrocket," said Steven Skerlos, U-M professor of mechanical engineering. "That will only make the inevitable shift to renewable energy less effective in maintaining a stable climate system throughout the lives of children already born." Before Trump's reversal of both the domestic and international climate plans, the Intergovernmental Panel on Climate Change had recommended a 70-percent cut in carbon dioxide emissions from industrialized nations such as the U.S., where nearly half of emissions come from the electric and automotive sectors. Using a custom, state-of-the-art model of these sectors, the researchers showed that the window for initiating additional climate action would close between 2023 and 2025 for the automotive sector and between 2023 and 2026 for the electric sector. "That's true under even the most optimistic assumptions for clean technology advancements in vehicles and power plants," said study lead author Sarang Supekar, a mechanical engineering postdoctoral fellow at U-M.
Withdrawal from the accord and the EPA's plan to repeal the Clean Power Plan will only make the chances of achieving the goal more remote, the researchers say. "In the absence of a government mandate, and if there is encouragement for coal to come back, then there's no way we can meet the target," Supekar said. To arrive at their findings, Supekar and Skerlos calculated the future greenhouse gas contributions of the auto and power industries based on two approaches going forward—"business as usual" and "climate action." Their calculations relied on the lowest-cost technologies in each sector. In the "business as usual" scenario, the auto industry followed its current rate of vehicle diversification—utilizing efficient internal combustion, electric and hybrid models, and the power sector utilized mostly natural gas and renewable plants. In the "climate action" scenario, those sectors relied on a greater percentage of cleaner automotive and power technologies to meet the IPCC climate goals. "At some point, likely by 2023, you actually can't build the newer, cleaner power plants fast enough or sell enough fuel-efficient cars fast enough to be able to achieve the 70-percent target," Skerlos said. 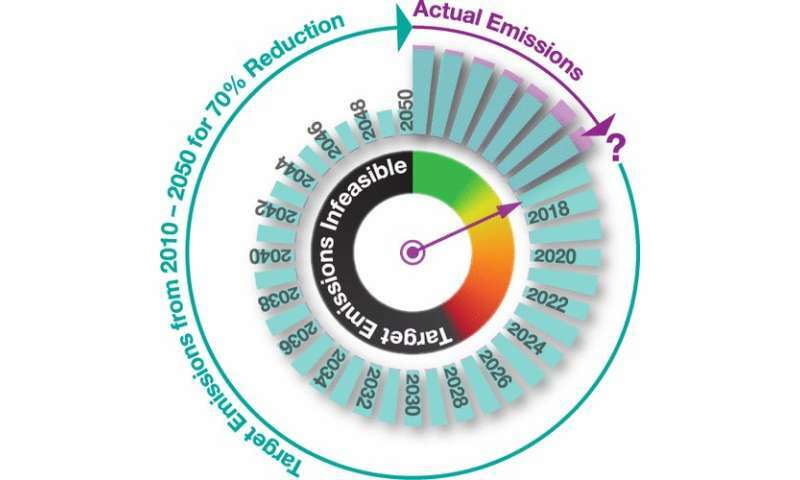 Added Supekar, "The year-on-year emission reduction rate in such dramatic technology turnovers will exceed 5 percent after about 2020, which makes the 70-percent target infeasible for all practical purposes." The analysis found no evidence to justify delaying climate action in the name of reducing technological costs, even under the most optimistic trajectories for improvement in fuels efficiencies, demand, and technology costs in the U.S. auto and electric sectors. In fact, the study found that waiting another four years to initiate measures on track with the 70 percent target would take the total cost for both sectors from about $38 billion a year to $65 billion a year. "You could take this same model or a different model and arrive at different cost numbers using a your own set of assumptions for "business as usual" or interests rates, for instance," Supekar said. "But the point is, regardless of whether the cost of climate action today is $38 billion or $100 billion, this cost will rise sharply in three to four years from now." The IPCC has determined that in order to keep Earth's average temperature from rising more than 2 degrees Celsius above pre-industrial times by the end of the century, global greenhouse gas emissions must be reduced between 40 percent and 70 percent by 2050. The U.S. is the largest cumulative emitter of greenhouse gases, and the electric and auto industries account for nearly half of the country's annual output. Fossil fuel combustion accounts for 95 percent of those industries' emissions. The study, "Analysis of Costs and Time Frame for Reducing CO2 Emissions by 70% in the U.S. Auto and Energy Sectors by 2050," is published in Environmental Science and Technology. They keep pushing back the deadline. Can't they just stick with one and get it over with so we don't have to listen to their hysterical bleating anymore? Please? The IPCC has no credibility. A monkey throwing a dart has a better chance of accurately predicting temperatures. Cue the Chicken Little graphic. Anyone curious about the record of predictions of the environmental movement should look up things like, "peak oil" "mass starvation by 1980" etc. A person making pure guesses about systems has a likelyhood of getting a 20% correct prediction rate. The environmental movement's accuracy is around 5%. Climate has inertia and frankly, will it be bad? Yes. Will we be Venus? No. Not for a good while yet. And by while I am speaking millions of years. Remember by the numbers of Earths climate history, we're still technically just at the tail end of an ice age. We are rising fast though! @ rrander, no 5% is bang on. Even Nostre Damus didn't do that well though. The best prediction experts are sitting at 5%. The point is humans shouldn't be predicting anything! And by while I am speaking millions of years. You're basing this statement on...what exactly? And yet we do because it has proven incredibly useful in the past to do so. I'm all for saving money. "An ounce of prevention..." and all that. But it seems there are plenty of people who have so much money that they's rather pay a lot later than invest little now. "You're basing this statement on...what exactly?" I'd take a guess at augury, but why go through the trouble of reading chicken entrails when they can just pull it from their posterior instead? Climate article has denialists commenting when you realize they must be getting paid for it. Next article he'll accuse them of not amending forecasts as information improves. Your trolling is usually more nuanced than this, aksdad. The IPCC doesn't predict anything. They provide a conservative snapshot overview of the science at a particular point in time. Will we be Venus? No. Not for a good while yet. You don't think there's a point between "bad" and "Venus" that may be concerning for us mere mortals? Or is climate a binary state for you?